at Roanoke, Va., Burger King, Nov. 4. Dozens of low-wage workers and their supporters, chanting “We can’t survive on $7.25,” held the first-ever Fight for $15 protest in southwest Virginia on Nov. 4. The protesters were out and loud during the noon lunch rush at the Burger King on Franklin Road SW in Roanoke. The multinational low-wage workers, many women of color, spoke out about economic and other outrageous injustices they confront daily, including having to juggle family responsibilities and two or three jobs to survive. Many youth and students also participated. Numerous supporters joined the protest, including the president of the Western Virginia Labor Federation, AFL-CIO, as well as union members from the Food and Commercial Workers, the Teamsters and the Virginia Professional Staff Association. Also present were the Coalition for Justice from Blacksburg, Va., Fight for $15 workers from Richmond, Va., $15 Now, the Peoples’ Power Assembly and Workers World Party. Messages of solidarity were received from Communication Workers Local 2204 and others. Fight for $15 Roanoke is planning more actions. 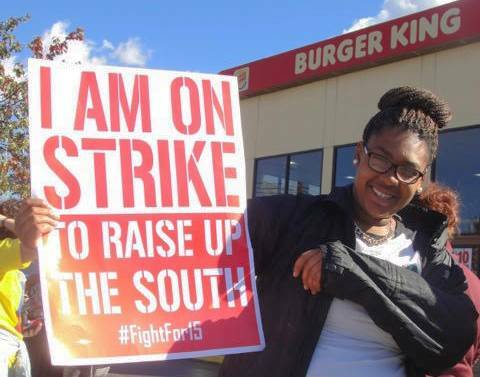 See facebook.com/Fightfor$15 or send email to fightfor15.org.